AN ALIEN SOUNDSCAPE - Researchers that SCUBA dive beneath the sea ice of McMurdo Sound, Antarctica are familiar with the mesmerizing vocalizations and body-shaking bellows of the resident Weddell seals. But, aside from a few previous recordings taken during the brief "summer" research season (Sept.-Dec.) when scientists have access to a safe, solid sea ice surface for marine field research, little is known about the hydroacoustics (underwater sounds) of this remote region. With a high-definition, research-quality hydrophone (underwater microphone) at seventy-feet (21 m) below the ice, the McMurdo Oceanographic Observatory (MOO) now records audio continuously, documenting the under-ice soundscape of McMurdo Sound at a resolution–and over a duration–never before achieved. Click above for audio stream (when available). Event schedules are shared on Twitter. The MOO's audio feed is available continuously for personnel at McMurdo Station, and may occasionally be broadcast live to the internet. 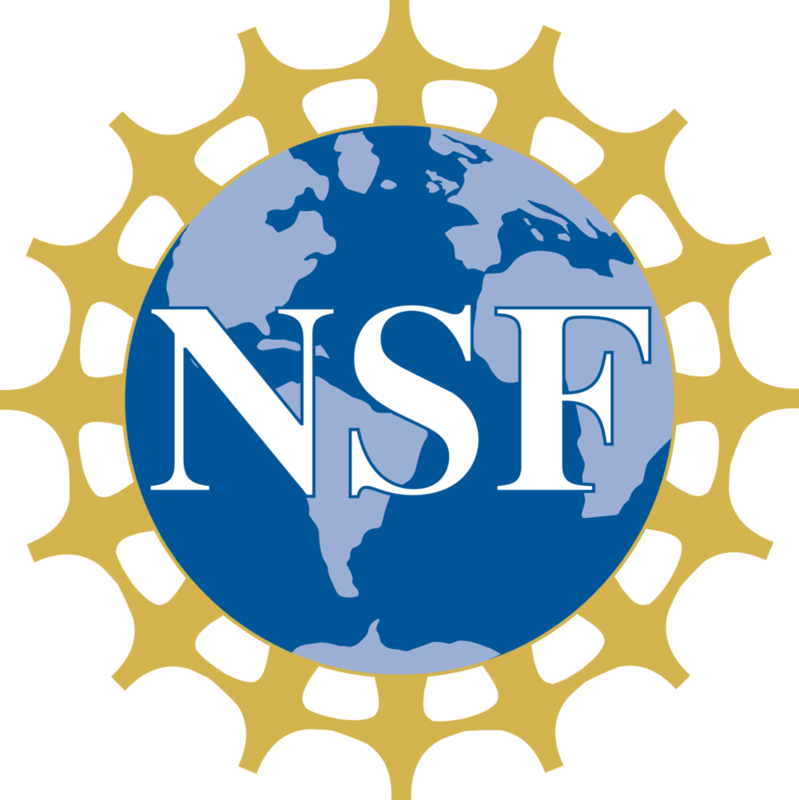 The huge volume of recorded audio data is being archived at McMurdo Station for future transport to our U.S. research institutions for in-depth analysis. These collected data (samples of which are available at right) will become the first multi-year record of the underwater soundscape in one of the southernmost marine environments in the world. With this aspect of the MOO project, we aim to document the bioacoustic (animal sound) signatures that reveal the presence and abundance of marine mammals that reside in or visit McMurdo Sound each year. By following changes in the types and frequency of the various calls of the resident Weddell seals, for example, we expect to contribute to an understanding of how the behavior of these southernmost marine mammals changes throughout the year. Furthermore, by teasing apart the acoustic spectrum, analyses of the recorded data may also reveal how invertebrate animal activities vary over time. And, by listening to its creaks, cracks and groans, how the character of the sea ice cover changes as it forms, melts, and breaks up each year. This MOO audio was recorded seventy-feet below the solid sea ice of McMurdo Sound. The otherworldly vocalizations of Weddell seals, which live year-round in McMurdo Sound, are a prominent feature of the underwater soundscape recorded by the MOO. A FULL-SPECTRUM ACOUSTIC RECORD - The MOO has two hydrophones: One of these underwater microphones operates in the human hearing spectrum (to frequencies less than 20,000 Hz) and was chosen for use because the audio signal is easily combined with the video stream from the MOO's camera. The camera thereby streams and records real-time video and audio simultaneously. The second hydrophone is a top-quality research instrument manufactured by Oceansonics Ltd., that records high-resolution audio data continuously to our hard drive storage array for later analysis. It records 512,000 sound samples per second, deciphering audio in the 10 to 256,000-Hz frequency bandwidth. This extremely-rapid sampling rate allows for the identification of ultrasonic marine mammal vocalizations, such as those produced by orca (killer whales) and beaked whales, as they come within "earshot" of the MOO. For comparison, a typical MP3 music file plays at only 22,000 Hz, and, depending on their age, a typical adult human's high-pitch hearing maxes out at only 10,000 to 19,000 Hz. WATCH AND LISTEN - Many marine mammal calls are distinct enough that they can be used to identify the vocalizing individuals to the species level, or even discern between different sub-species or family groups within a species. In addition to listening directly to bioacoustic (animal sound) recordings, scientists often create spectrograms of the recorded audio data. These graphical representations of how sound frequencies change over time allow visualization of patterns in the recorded audio, recognition of sounds at much higher frequencies than humans can hear and, given distinct shapes and patterns, rapid identification of marine animal presence and activities. We will use these spectrograms, along with number of sophisticated tools that can process and automatically identify marine mammals species based on their calls, to gain new insight into McMurdo Sound's unique biology. In our live data viewer at McMurdo Station, a spectrogram of the current sounds recorded by the MOO scrolls continuously across the page. While it is currently not possible to transmit live audio to the world over McMurdo Station's limited satellite internet connection, MOO project staff can watch the spectrogram data on their computers as it comes in. This allows us to find, download and analyze portions of interesting or exciting sounds only a few minutes after they occur beneath the ice thousands of miles away. FOR YOUR LISTENING PLEASURE - We have prepared a number of audio samples with accompanying spectrograms for your listening and viewing enjoyment. In these playable audio spectrograms (linked near the top of this page and below) the vertical axis represents the sound frequency (higher up means higher pitch), the horizontal axis represents time, and the color represents the intensity of the sound. Close your eyes and imagine that you're floating beneath McMurdo Sound's icy ceiling as seals, whales, divers, and ice squeak, squawk, grumble and crack in your ears. A curious Weddell seal investigates project leader Paul Cziko at work on the MOO. 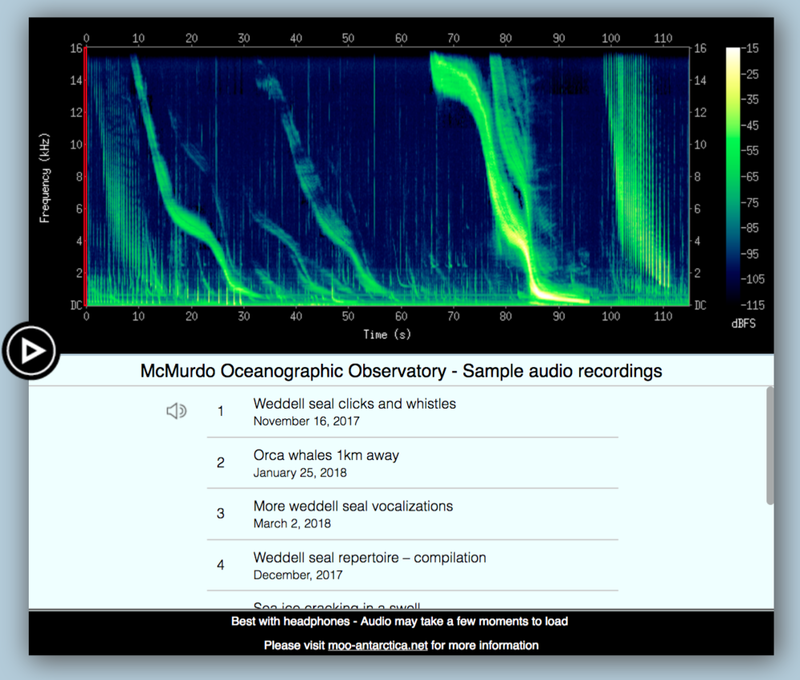 A two-hour sample of the McMurdo Sound underwater soundscape as recorded by the MOO during prime Weddell seal breeding time in November 2017. The audio is presented along with a spectrogram–a visual representation of the recorded sound. Sounds of killer whales (orca) near the MOO after the sea ice broke out in February 2019. The audio is presented along with a spectrogram–a visual representation of the recorded sound.